Stocks are clinging to the ledge of a massive cliff. 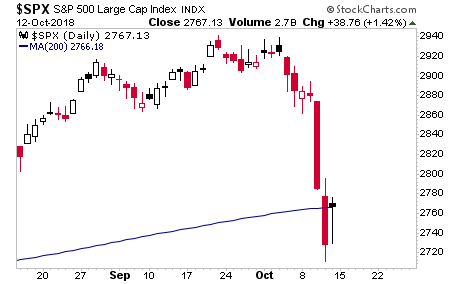 It was only through multiple trader games that stocks were able to reclaim their 200-DMA on Friday. 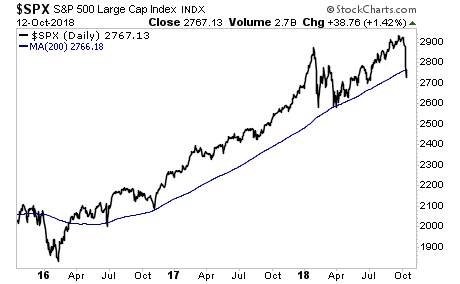 This line is of TREMENDOUS importance as it has acted as critical support ever since this last bull market began in early 2016. The fact that it required this many trader games and manipulations to reclaim it on Friday tells us that stocks are in SERIOUS trouble. So while it’s likely we’ll get a relief bounce this week (it is options expiration week, which usually features a rally of some sort), the fact remains that unless a MAJOR rally begins now, there are nothing but air pockets from here down to 2,400 on the S&P 500. 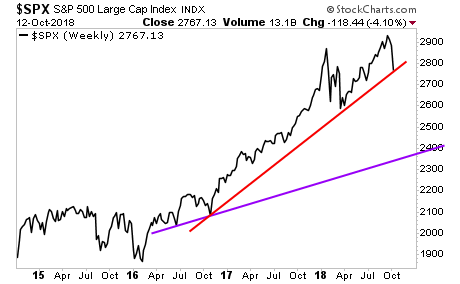 Again, stocks are clinging to the ledge of a giant cliff. And unfortunately, it’s looking more as if the bull market has ended. As I’ve been warning clients for the last two to three months, “it’s late 2007” for the markets.